with the support of New York’s labor and Latino communities. New York-- El Diario employees, the Newspaper Guild of New York officials and supporters from the NYC Central Labor Council, Labor Council for Latin American Advancement, the Newspaper Deliverers Union, the NYS AFL-CIO, the South Bronx Community Congress and community members gathered today on the steps of City Hall to demand an end to the illegal firings and threats against union-represented workers at the media company, and called for the reinstatement of eight illegally fired workers. Following the press conference, the illegally fired employees and their Guild representatives had several positive and productive meetings with elected officials who expressed their support and pledged to do more on this issue. The Guild has scheduled several follow up meetings with local and state elected officials to discuss the ongoing labor violations at El Diario. ImpreMedia, El Diario’s parent company, has pursued a pattern of intimidation and retaliation against its newsroom staff that threatens to erode the quality of journalism at the nation’s oldest Spanish language newspaper. 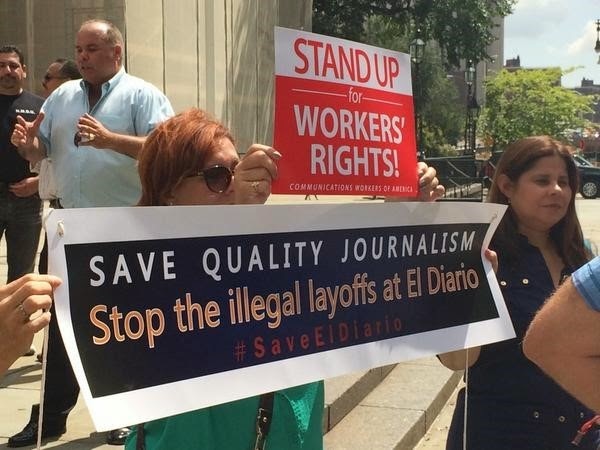 “We will continue to fight against El Diario’s union-busting moves until these journalists have been reinstated. 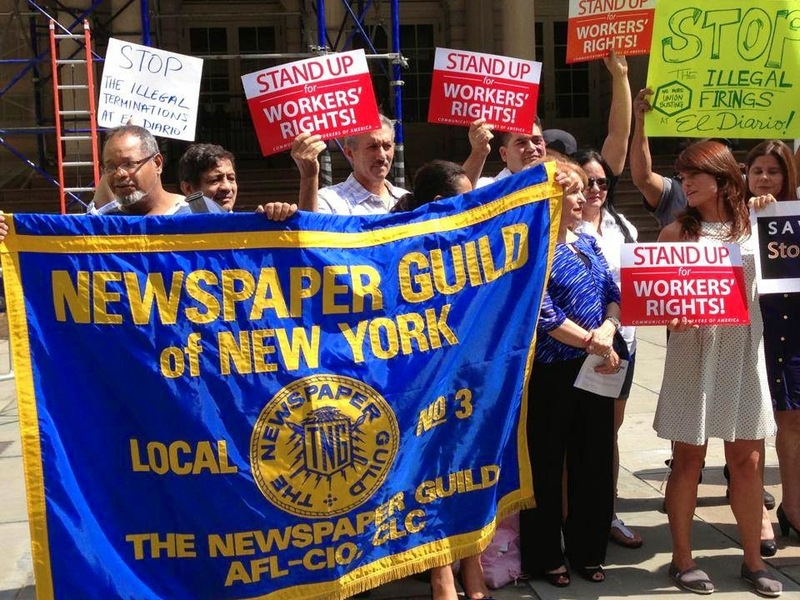 The Newspaper Guild is doing everything it can to save the jobs of its members and support high-quality journalism for a Spanish-speaking audience,” said Guild President Bill O’Meara. “ImpreMedia, as many commentators have noted, appears to have made a business decision to abandon its longtime core readers in New York. The decision to fire veteran journalists who covered the courts, the police and the city’s Hispanic communities is consistent with that business decision. Union employees are without jobs, the Guild is under attack and readers are getting shortchanged. This management is shafting everyone,” said Guild Secretary-Treasurer Peter Szekely. 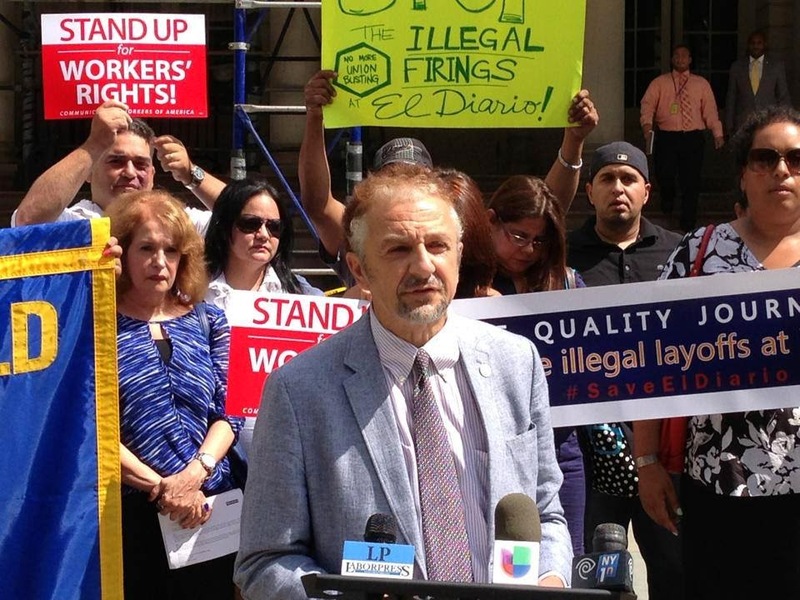 On June 13, ImpreMedia illegally fired eight El Diario employees, claiming they were economic layoffs. The firings, which violate the company’s contract with the Guild, were the latest in a series of anti-union actions by management to replace the veteran journalists who have long covered the Hispanic communities of New York. The company has since hired several nonunion employees and continues to threaten current workers who speak up. The Guild is seeking a court order to require ImpreMedia to reinstate the eight employees while the dispute is being litigated. Stay up to date with what’s going on – follow us on Twitter at @eldiarionyguild and “like” our Facebook page.